After plenty of split albums and demos, finally came out the first full-lenght Noothgrush album. Some of the songs were not completely new and appeared on their short previous materials before, but it's definitely better to listen everything together. 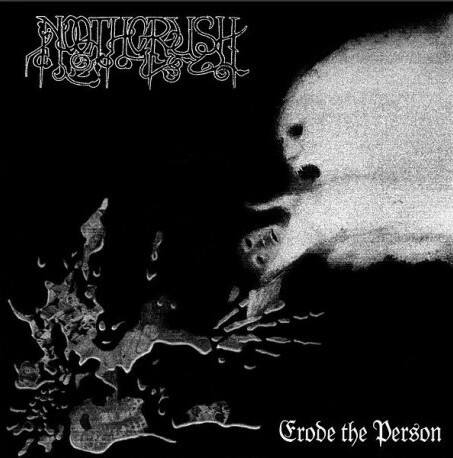 As one of the earliest sludge metal bands, Noothgrush counts as a veteran and cultic band of the genre. Their music was very similar to Grief, not only because they were also into sludge/doom, but the sound and the vocal style are almost the same. So if "Erode the Person" was came out as an actual Grief album, nobody would have complained. The wave of bitter anger could carry away the unsuspicious listener by that over one hour long heavy, noisy, depressing suffering, that illustrates well the seamy sides of life. Such as most similar albums, this also introduces a tragical performance of self-torment with common political references and occasional sarcasm. A very demoralizing record especially in this extented lenght. These are the most common features of a sludge metal masterpiece.